Heat a cooking pot over medium heat. Sweat the onion, garlic and bay leaves in the olive oil for 5 to 8 minutes. Add the white wine, butter and clams. Cook until the shells open (around 8 to 10 minutes). Just before serving, season with pepper and garnish with coriander. 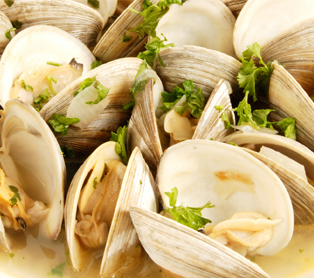 Be sure to put the lid on the pot when cooking the clams. Remove them from the heat as soon as they open so you don’t overcook them; they can become rubbery very quickly.